Corporate income taxation, by affecting the after-tax cost of funding, has implications for a bank’s incentive to securitize. 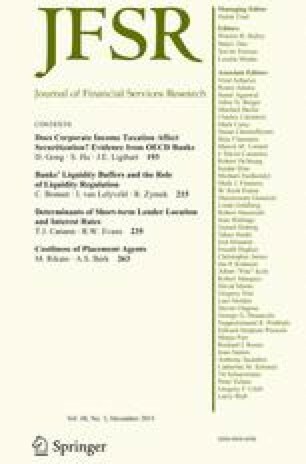 Using a sample of OECD banks over the period 1999–2006, we find that corporate income taxation led to more securitization at banks that are constrained in funding markets, while it did not affect securitization at unconstrained banks. This is consistent with prior theories suggesting that the tax effects of securitization depend on the extent to which banks face funding constraints. Our results suggest that current corporate income tax systems have distorting effects on banks’ securitization decisions. Jenny E. Ligthart suddenly passed away on November 21, 2012. She was always enthusiastic and tirelessly available to her students, anytime and anywhere. We remember her as an excellent researcher, a professional teacher, a helpful supervisor and a close friend. We are indebted to George Pennacchi and Wolf Wagner for the inspiring discussions. We thank an anonymous referee, Steve Bond, Michael Devereux, Bálint Horváth (discussant), Kebin Ma, José-Luis Peydró and Jing Xing (discussant) for their insightful comments. We too are grateful to participants at the GSS seminar at Tilburg university, 6th International Risk Management Conference, Banking summer school at Barcelona GSE, CBT doctoral meeting 2013 at Oxford University, University of Birmingham, University College London, and 13th FDIC-JFSR Annual Bank Research Conference for their comments. The usual disclaimer applies. is the dependent variable in Tobit regressions. of ABS issuance and TA represents bank total assets. in a bank’s tax obligation as income rises. Statutory tax rates of corporate income taxes. share of operating income from foreign subsidiaries. operating profits from foreign subsidiaries. country, and zero otherwise. Lagged by one period. in each country, and zero otherwise. rates in each country, and zero otherwise. Ratio of bank equity to total assets. to the standard deviation of ROA. Return on assets. Lagged by one period. Log of GDP per capita (constant 2005 USD). Annual growth rates of real GDP per capita. Annual growth rates of the GDP implicit deflator. The volume of stock traded as a percentage of GDP. management procedures to the public.